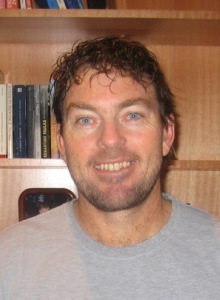 Kevin has worked for 25 years in sports biomechanics and skill acquisition. After seven years at the Australian institute of Sport Biomechanics unit, Kevin completed his masters and PhD at Victoria University before working as assistant coach/biomechanist for the Fremantle football club. Kevin is currently the Australian junior AFL kicking coach, the South Sydney Rabbitohs kicking coach and consults to a number of AFL clubs. He is also on the editorial board of Sports Biomechanics, a director of the International Socieyt of Biomechanics in Sport, an associate member of the AFL Sport Science Advisory Group and is a member of the AFL kicking skill acquisition group. Kevin has (co)authored two book chapters, 35 peer reviewed journal articles and over 50 conference papers as well as numerous coaching guides. Dr Ball has also presented five national and international keynotes and 10 invited talks. Ball, K. (2013). Loading and performance of the support leg in kicking. Journal of Science & Medicine in Sport, 16, 455-462. Ball, K., Talbert, D, and Taylor, S. (2013) Biomechanics of goal-kicking in rugby league. In H. Nunome, B. Drust, & Dawson, B. (Eds. ), Science and Football VII (pp. 47-52). New York: Routledge. Phillips, E., Farrow, D., Ball, K., and Helmer, R. (2013) Harnessing and Understanding Feedback Technology in Applied Settings. Sports Medicine 43, 219-232. Lorains, M., Ball, K. and MacMahon, C. (2013). An above real time training intervention for sport decision making. Psychology of Sport & Exercise, 17, 670-677. Kevin has been a leader of or contributor to 12 academic and research consultancy projects with a total funding allocation of more than $500,000. Kevin has extensive industry experience across the spectrum of sports science having working in the Sports Institute system, professional sport and university. During this time Dr Ball has chaired or been a member of sports science committees for Fremantle, Melbourne and the Western Bulldogs AFL clubs, Melbourne Storm and South Sydney Rabbitohs NRL clubs and Australian Waterpolo. Game Day, Channel 7 (2013), Comparing Sherrin and Burley balls. SEN radio (2012, 2013) Numerous interviews on kicking issues.